Ink & Paint, The Women of Walt Disney’s Animation by Mindy Johnson corrects the misguided perception regarding women’s lack of contribution to the animation industry. Setting the record straight Johnson has produced an encyclopedic, well-researched and fascinating account of women in the film industry. It encompasses everything from the invention of celluloid, to the silent film genius Georges Méliès’ staff hand coloring of film footage, to Disney studio’s Ink & Paint department. Johnson goes back to the early days of zoetropes, experiments in persistence of vision, and Edward Muybridge’s photographic experiments of 1872, all of which inspired dazzling images and concepts that paved the way for filmmaking and cell animation. The onset of wars such as the Civil War and World War II, which called upon tens of thousands of men to become soldiers, created a vacuum in the United States’ workplace that women were apt to fill. Although Johnson heavily tilts the narrative to emphasize the hitherto under appreciated contributions of women in the Disney studio, as well as in the personal lives of Walt and Roy Disney, there is a wealth of information on the Disney company, their beginnings and motivations, the circumstances that necessitated the creation of Mickey and Minnie Mouse, and the choices made in developing their short animations to keep the studio thriving, and later via their feature film projects. The book delves deeply into the complex relationship Walt Disney had with his staff over the nearly 40 years of company leadership, with emphasis on his many female employees, the structure of the company, its innovations, and its challenges in creating cutting-edge animation. All of the inkers in the Ink & Paint department were young women. As the father of two daughters with whom he had a caring relationship, Walt Disney sought to create a safe haven for his female employees for the sake of both ladies and the artwork. The book also makes repeated reference to the fact that men dominated the industry, as lead animators and heads of departments, who typically resented women intruding into their space. Departments such as Ink & Paint, headed and staffed by women, was not problematic; however, inserting women into departments staffed largely by men was usually frustrating for both. During the Depression Disney paid his Inkers an average of $15 to $18 a week. Johnson writes, “Having any sort of steady job was considered a success, but having a job at Walt Disney Studios during the 1930s was like winning the lottery.” To put that in perspective, during the 1930s a gallon of gas cost 10 cents, and a pair of men’s dress shoes cost four dollars. The intricately detailed history creates fascinating reading but makes it difficult to follow a simple overview of the company. Yet the book’s index is extensive, which makes finding specific topics a great deal easier, as do the many excellent sidebars that highlight various women whose talents and insights contributed to the company’s production methods and success. Women such as Hazel Sewell, who was with Walt and Roy from the beginning and oversaw the development from a handful of Tracers & Opaquers into its vast evolution as the Ink & Paint department; Dorothy Ann Blank, a former journalist who developed early story treatments and wrote dialog for Snow White and the Seven Dwarfs; Luisa Field, who edited music on Fantasia and was the first female Music Editor in Hollywood history; Barbara Wirth Baldwin, who was an airbrush expert in the 1930s and became the head of the Airbrush Department; Marion Wylie Stirrett, who along with other women in the Background Department painted backdrops for Pinocchio, Fantasia, and Bambi; and numerous other women. What becomes obvious is that the women of the Ink & Paint department were very talented artists in their own right, who in order to actively translate the same dynamic action envisioned by animators and in-betweeners were imbued with a true mastery of line inking that went beyond mere tracing. Many women were promoted out of Ink & Paint to become full-fledged animators or heads of departments. The book takes a comprehensive view that also includes women outside of Disney, like Lillian Friedman Astor, who worked as an inker and animator at the Fleischer Studios in New York on Popeye and Betty Boop cartoons; and LaVerne Harding, who worked with Walter Lantz, creator of Woody Woodpecker. Within its 95-year history of the Disney company, the book touches on the planning of Disneyland, unions and strikes, the huge impact of xerography [the Xerox-ing of drawings directly onto transparent cells, bypassing the inking process] on the Inkers as a means of lowering production costs, and the company’s foray into live action films like Mary Poppins and TRON. 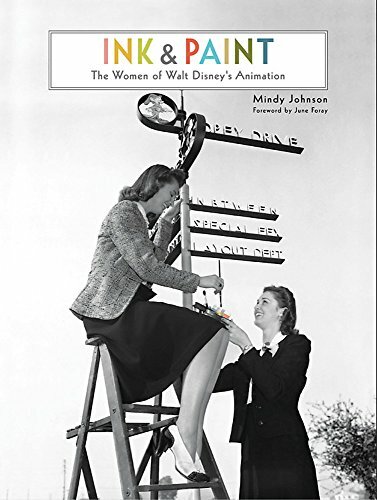 Ink & Paint, The Women of Walt Disney’s Animation by Mindy Johnson is a densely packed—at times overwhelmingly so—intricate history of women in the animation industry with a large spotlight on Disney, both the man and the company. It is a 385 page, 10 x 13 inch tome with lavish reproduction of Disney artwork, many photographs, and detailed descriptions of the production processes of animated films that will repeatedly engage readers for hours.